This page will guide you to use professional partition software to extend space of C drive without rebooting on Windows Server 2012. Download IM-Magic Partition Resizer Server to fix low disk space on C drive on Windows Server 2012 without rebooting computer. C drive is an important part on a computer because Operating System is usually installed on this partition. In addition to Operating System, there are some other files like Internet temporary files, downloaded program files, etc being stored on this partition. Therefore, C drive might be running out of disk space easily. When C drive is running on low disk space on Windows Server 2012, what can you do to fix the problem? Well, if you really run into the problem, you can use IM-Magic Partition Resizer Server, which is a professional partition tool to resize partition Windows server 2012 in a safe and easy way. Download, install and run IM-Magic Partition Resizer Server on your computer. 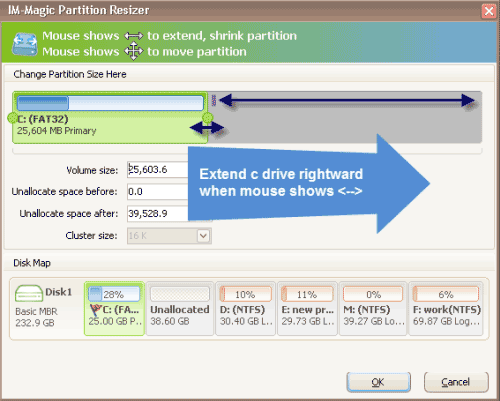 Right click a partition that has enough free space and choose "Resizes/Move" option. Move the arrows to increase the size of C drive and click "Apply" button. "I need to reallocate some free space to C drive on Windows Server 2012 because system always reports low disk space warning message. The Operating System is installed on C drive, so I am wondering whether I need to reinstall system and reboot my computer in order to reallocate disk space for C drive. Can anybody give me some help?" "Can somebody recommend a partition tool with which I can resize hard disk on Windows Server 2012? 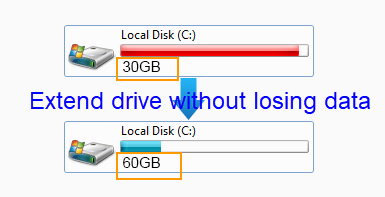 I want to resize hard disk because C drive is running out of disk space on Server. I opened Disk Management and attempted to resize disk there, but the Extend Volume under Disk Management is grayed out. Therefore, I want to use a partition tool to perform partition resizing so as to fix the low disk space problem on C drive." One advantage of Windows Server 2012 is that Disk Management enables its users to resize hard disk by extend volume and shrink volume without repartitioning hard disk. First of all, you need to make sure there is free space on other partition on the same hard disk. Then, you can right click the partition and choose "Shrink Volume" option so that you can squeeze some unallocated space from the selected partition. When you see the unallocated space, you need to move it behind the C drive. Finally, you can right click C drive and choose "Extend Volume" option to add the unallocated space to the partition. 1. Unallocated space is needed in order to extend C drive under Disk Management, so you need to shrink partition to get some unallocated space first of all. The fortunate thing is that Disk Management enables you to shrink partition to create unallocated space easily. 2. You need to move the unallocated space behind the C drive. Unfortunately, Disk Management doesn't allow you to move partition. Tip: If there is no unallocated space or the unallocated space is not behind the C drive, the "Extend Volume" option will be grayed out and you cannot extend the partition. If Disk Management failed to extend C drive on Windows Server 2012, you can use the partition magic for Server 2012which provides much easier solution for partition resizing. This partition software works as partition magic to shrink volume to squeeze unallocated space. It also allows you to move partition close to C drive so that you can add the free space to the partition. You can resize hard disk without reinstalling system or rebooting your computer by using this partition software. The partition software cause no hurt to Operating System or data stored on the partition during partition resizing.